I was in the Johannesburg High Court on Wednesday 13th November 2013 to oppose a Bill of Taxation that was handed to me by STANDARD BANK, after I tried to defend their unlawful foreclosure on my house. They want me to pay them around R260,000 - because I defended myself against their unlawful actions. The Tax Consultant attorney for STD Bank, Heleen van Dyke, made it very clear to me in front of the Registrar of the Johannesburg High Court, that the Court does not dispense JUSTICE – It enforces the law. This statement was very clearly supported by Registrar Naidoo, as I asked him whether this was a “people’s court”? He looked at me with a blank expression and in a twisted roundabout way made it very clear that this is NOT a people’s court, where people come to get justice. This was a clear indication of the high level of ignorance by many of the senior officials in the legal system of South Africa and the rest of the world. I was given till 27th November to come up with arguments against the R260,000 Bill of costs. I claim that the Bill that I was presented with was defective, as it does not conform to the specifications of the Bills of Exchange Act in South Africa. We will see what transpires. I still hold firm that if this is not a people’s court, and therefore we, the people, have no business there. It is intended for corporations and commercial law – not common law for the people – that is why we the people are treated as little corporations represented by our birth certificates and ID documents in these courts. Such documents are the “possessions” of the government corporations that issue them to us, the people. Our courts are not meant for people. For those that have not been following my particular case, here is brief history – it presents a great lesson for everyone and I will outline a recommended step-by-step approach for you to follow if you have been caught up in facing a bank in court – or any other corporation for that matter. In November 2010, I dug my heels in and demanded proof of ownership from STD Bank of the so-called home loan they made to me, and I stopped payments until I had proof and clarity from them in writing. This was bluntly ignored and refused – after several attempts in writing and “notarised affidavits” of demand. The notarised affidavits proved to be a complete waste of time and did not assist in any way once the matter got to court. During this process I also chose to test another avenue of payment – “Acceptance for value”, or “A for V” – as it is often called. I paid off the so-called loan with a Bill of Exchange for around R970,000 that I had drawn up by the same STD Bank, in the Sandton Branch. The bill was accepted for value by me under onerous title and it was delivered to the bank via registered mail. STD Bank acknowledged in court that they received the Bill, after I raised the issue, but they did their best to ridicule the method of payment. After being questioned by the judge as to where the Bill was, they said that they did not know. I accused STD Bank of theft and demanded my Bill, of some R970,000 ($97,000) to be returned to me. The judge bluntly ignored this request an pretended as if it never happened or as if it was not even discussed. The judge said, “if the Bill is not in the court, we cannot discuss it”. If only I were wise enough to realise how this affected the whole case. All I had to say was that “if the original wet-ink contract is not in the court, we cannot talk about it and the entire case must be dismissed with costs in my favour”. But I was still on a steep learning curve at this stage and did not recognise the gift I was handed by the judge – and so it escaped me. The theft of my Bill is currently being investigated by the Sandton Police and I await a response from the state prosecutor. If they deem that it is in fact a case of theft, which it is, this will become real problem for the entire banking industry – criminal charges will be laid against all the banks by many people and could close down the entire banking crime syndicate in no time. I carried on with my arguments in court and I claimed that STD Bank was no longer the owner of the bond or contract and therefore had no right to make any claims against me. This is because they participate in a scheme called “securitisation” where the banks sell all contracts, promissory notes, and other negotiable instruments to third parties – during which they lose all rights to the original contracts, or what is called in legalese “locus standi”. In an extended case and 3 High Court hearings in Johannesburg, during which the uninformed media called me all kinds of names, we managed to attain a great deal of knowledge and hands-on experience that is now helping thousands of others. Although I lost the case, and my house was sold on auction, I am able to share valuable information with everyone from my experiences. The bank does not have the money they claimed to “lend” me. They create money out of thin air with fancy accounting consisting of debits and credits. At first they claimed that they did not securitise my contract – lying under oath. Then they conceded that they practice securitisation and sell our promissory notes to third parties – claiming that what they do with the contracts behind the scene is none of my business. The original contract was never presented in court as evidence. After a 3-hour hearing the judge pulled out a piece of paper and read a pre-written judgement to a stunned court room filled with people who could hardly believe their eyes. And so, another fraudulent judgement was handed down to protect the criminal activity of the banksters. In my next update on how to respond to a banks demands for payment I will share my lessons with everyone. I know of several people whose cases that have benefitted from our experience and cases have been withdrawn by banks when they realise that they may have to expose some sensitive information in court. 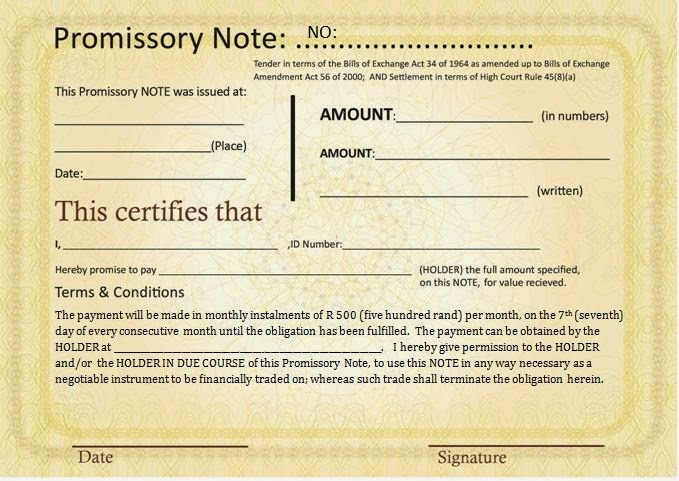 See the promissory note below and adapt it to your own needs. 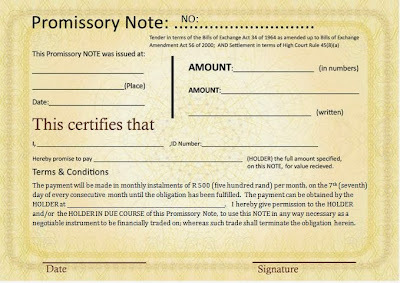 We have a precedent in which I paid a Court Order of around R160,000 to STD Bank in June 2013, with promissory note, that was accepted and not contested in any way.